IndyCar Racing superstar Ed Carpenter always wanted to be a race car driver. Growing up, Ed’s friends would tease him when he would forgo playing sports only to dream about racing. Nowadays, they clamor for tickets to see him compete with Vision Racing in IndyCar Racing Series events like the 90th Running of “the greatest spectacle in racing”, the Indianapolis 500, which will be held this year on May 28 at the Indianapolis Motor Speedway. When Carpenter first broke in to the sport, he was best known for being the stepson of IndyCar founder, Tony George, but he quickly made a name for himself. In 2003, just months after graduating from Butler University with a degree in Marketing, Carpenter won the Freedom 100 at Indianapolis Motor Speedway and, now in his third full season of IndyCar Series competition, he hasn’t slowed down since. Carpenter hasn’t been alone on this ride. 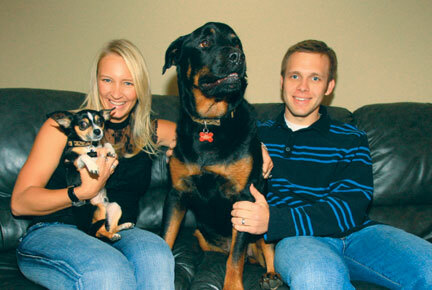 He recently moved to a new home in Indianapolis with his wife, Heather, and he has some very special members of his pit crew: a Rottweiler named Bentley and a Chihuahua, Roscoe. Bentley used to travel with Carpenter to all of his races and even had his own “hard card” (that’s racing speak for a season credential). When Bentley grew too large to travel, Roscoe stepped up to the plate and has become a constant traveling companion for Ed and Heather. We wish Ed the best of luck in all his races this year, and thank him for answering our Inner Dog questionnaire. What are their ideas of perfect happiness? What are their favorite treats? If each could change one thing about himself, what would it be? Both - That they had balls. What are their most treasured possession? What are their most endearing qualities? Assuming there is such a thing as reincarnation, what or who might they have been in a former life? Is there anything that embarrasses them? What is it that they dislike most? What is their greatest accomplishment? What is their favorite place? What do they really like in other dogs? Does they each have a motto? Rosco – I’m not little.